Finally ... the day before Halloween ... we carved our pumpkins. 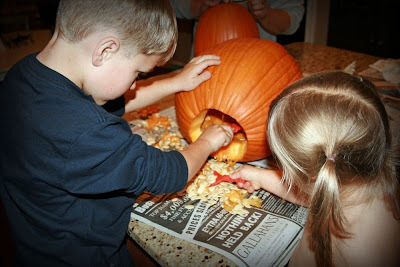 Kyle and the kids gutted them and I designed ... okay, I carved ... them. Mason wanted Batman, of course, and we decided to give Chicky a Hello Kitty pumpkin ... from scratch! Gosh I'm good! Stay tuned, because tomorrow Batman and Batgirl will make their debut! Great pumpkins! 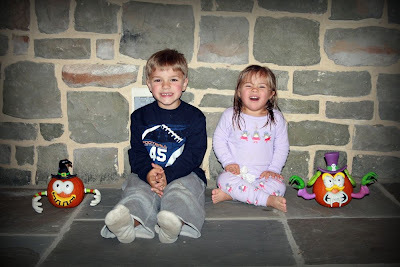 We had a little pumpkin and a gourd sitting outside our apartment door in the hallway and Samantha would love to play with them and look at them. Until one day when I went to pick one up and discovered they'd rotted and were all squishy and stuck to the carpet. LOL! They sure look like they are having fun! Can't wait to see Batman and Batgirl pictures. 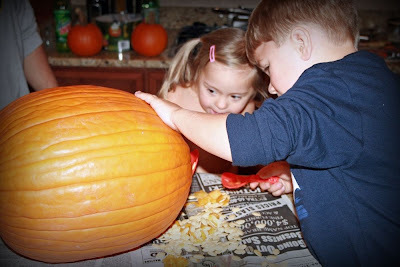 Your kids are adorable--all three of them...and next year you will get to carve 3 pumpkins. those pumpkins are cute. the hello kitty one is just adorable. you did a great job. can't wait to see the costumes!